Life is often unpredictable. Many times, bad things happen that no one would ever see coming, not even ourselves. And such is the case for the people in each of these stories. Some will be attacked by vicious animals, while others navigate through wild weather. The rest will find themselves in freak accidents, coming face to face with the supernatural, being a part of something out of this world, and many other situations that can only be described as unfortunate. With traces of romance, adventure, humor, thrill, and mystery woven in, there is a story for anyone looking for an entertaining read while being short on time. And with just the right blend of horror and tragedy, this collection will leave you dreading the possible. 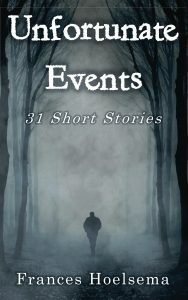 Unfortunate Events: 31 Short Stories is available in paperback and eBook format. Paperback can be found on Amazon or CreateSpace for just $9.99. The eBook can be found on Amazon for just $1.99 by clicking HERE! It’s also available on Kindle Unlimited for FREE! Great news, though!! To celebrate this release, it will be FREE for ALL for two days next week! Can’t beat FREE, right!?!? All you have to do is click HERE between Monday, September 11, and Tuesday, September 12! Enjoy! Now on to my next novel….